In large bowl, mix vegetable oil, taco seasoning mix, cumin, coriander and salt. Add pork, and toss to coat; pour into 5-quart Dutch oven. Place onions and garlic on top of pork. Pour in water, orange juice and lime juice. Heat to boiling over high heat. Stir; reduce heat to medium-low, and simmer uncovered 2 to 3 hours, stirring occasionally, until pork is tender. Increase heat to medium; cook, stirring frequently and pressing on pork with spatula to shred meat, 10 to 15 minutes or until sauce thickens and pork is coated in cooking liquid. Serve in tortillas with toppings. Remove as much fat as possible from the pork to avoid a fatty sauce. Leftover carnitas are great in bowls, too! Heat and serve over rice, quinoa or couscous with your favorite fresh veggies. 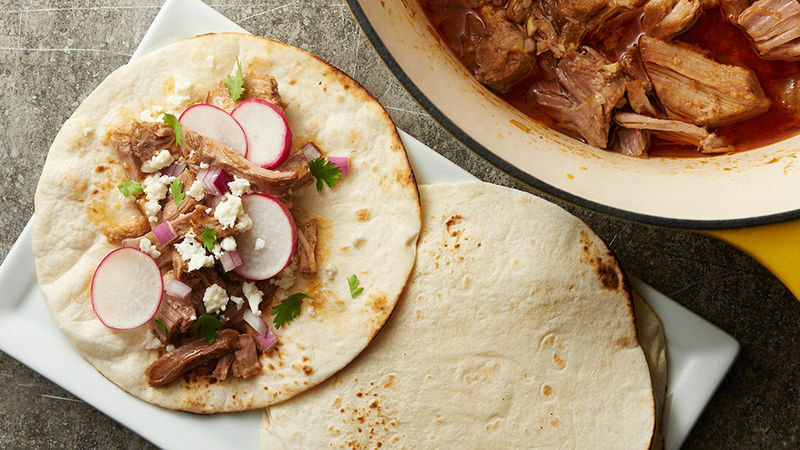 Your search for the best easy carnitas recipe ends here. If you’re a fan of Mexican food (and really, who isn’t?) this is definitely a recipe you should know about. And we’ll let you in on a little secret: if you can make pulled pork in a slow cooker, you can make carnitas. Put it in tacos or burritos, or just serve it over rice for the easiest bowl ever.